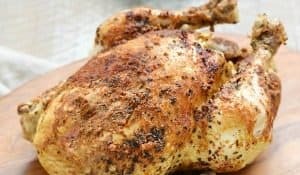 My poor Instant Pot®was feeling sad and neglected last week so I figured it was about time to create a new recipe. 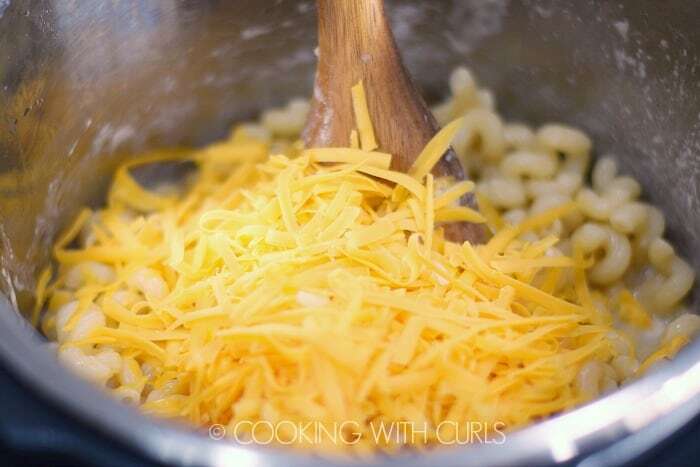 Several ideas popped into my head but I was craving cheese, so I knew that I had to come up with a rich and creamy Instant Pot Macaroni and Cheese recipe to share with you….. 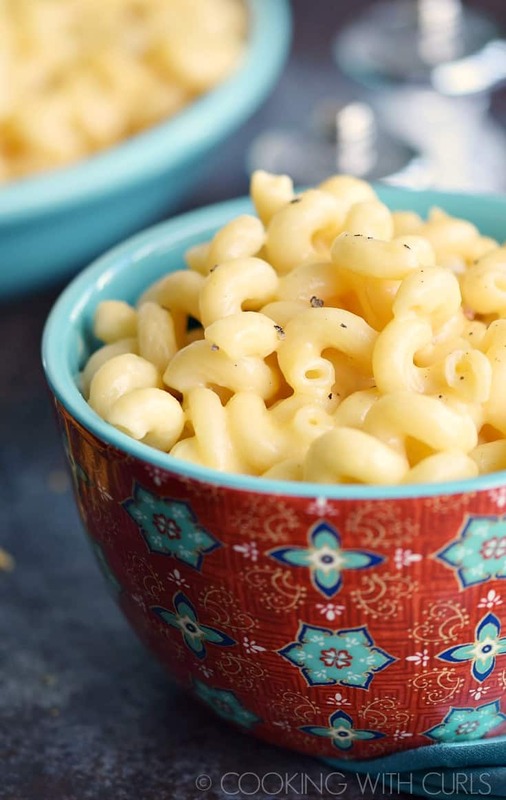 I could have gone crazy and topped my Instant Pot Macaroni and Cheese with bacon bits, broccoli, or even additional cheese, but I opted to keep it simple. Why not let the delicious cheese flavors shine and be the star of the show, right? 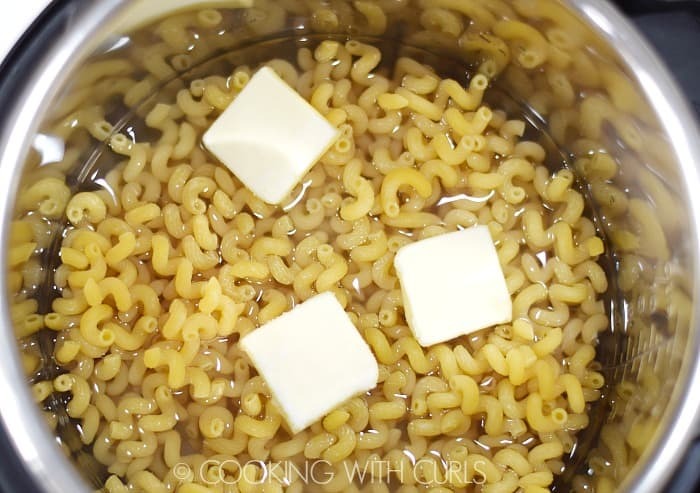 Add the dried pasta, water, salt and butter to the liner insert….. Secure the lid and make sure the venting knob is in the “Sealing” position. 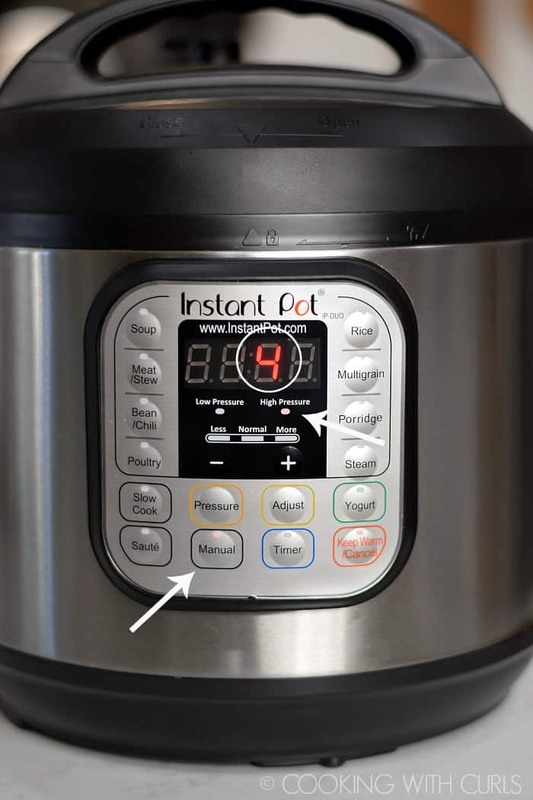 Press the “Manual” button, on “High Pressure” and use the + and – buttons to set the timer to 4 minutes….. When the timer beeps place a towel over the venting knob and “Quick Release” the pressure. Pull the knob in short bursts to avoid a foam explosion. If you hear gurgling, turn it off and try again…..
Press the “Cancel” button, then the “Saute” button. 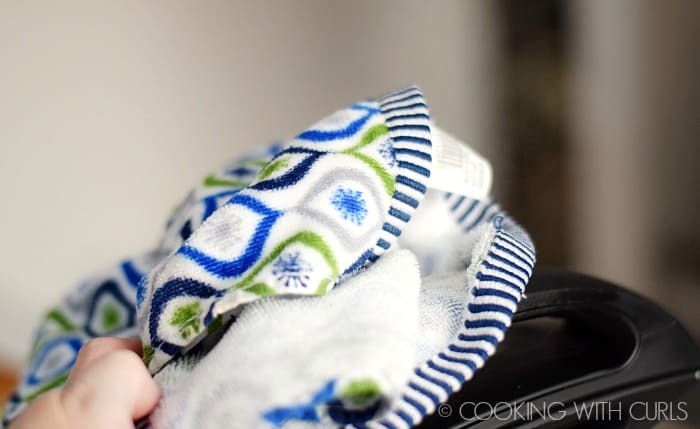 Add the cheeses a little bit at a time stirring in between…..
Continue stirring until all of the cheese is melted. 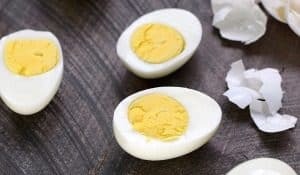 Pour in the milk and add the dry mustard, paprika, onion powder and cayenne…..
Stir until thoroughly combined and the mixture starts to thicken. Season to taste with sea salt and black pepper. 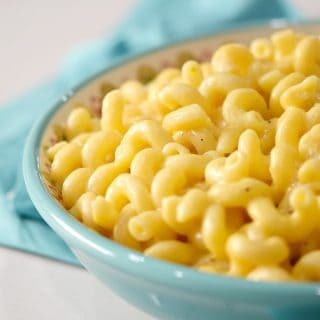 Turn the pressure cooker off and serve…..
Macaroni and Cheese is still one of my favorites! I used Sharp Cheddar and Gruyere cheese, but you can substitute Gouda or Monterrey Jack for the Gruyere. When you first remove the lid there is still quite a bit of liquid left in the pot. 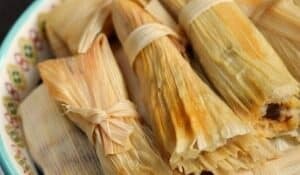 Do not try to cook all of the liquid out or your pasta will end up being dry. 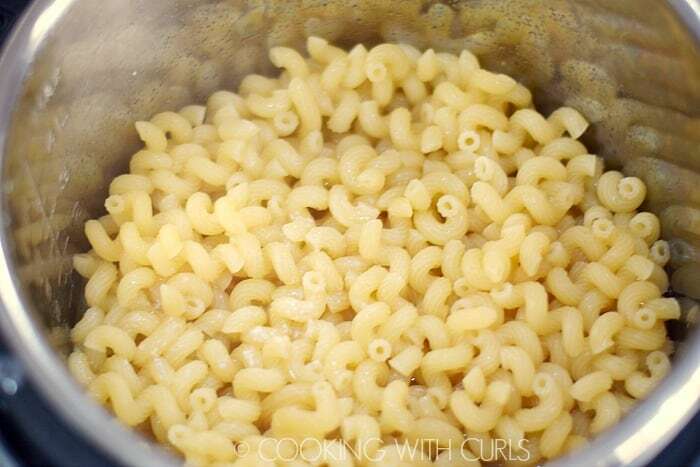 I used CashewMilk so my Instant Pot Macaroni and Cheese is thinner than if you use whole milk or heavy cream. I used Cellentani shaped noodles because I love the shape. 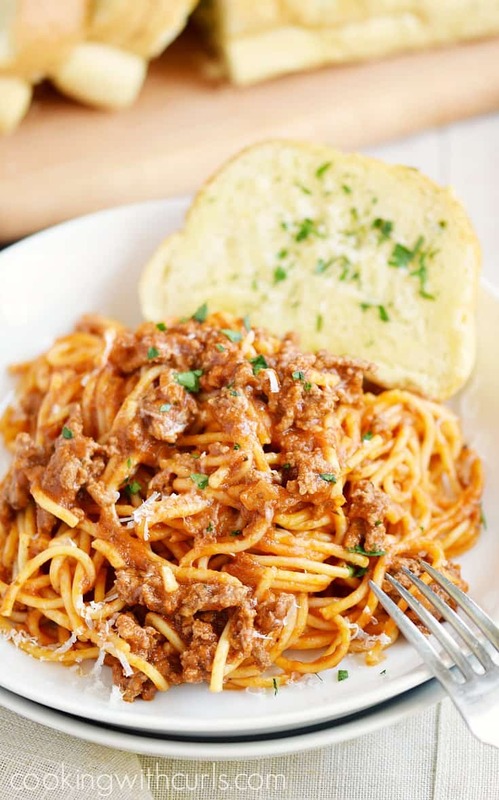 You can use any noodles that you like, but adjust the cooking time if they are significantly smaller in size. 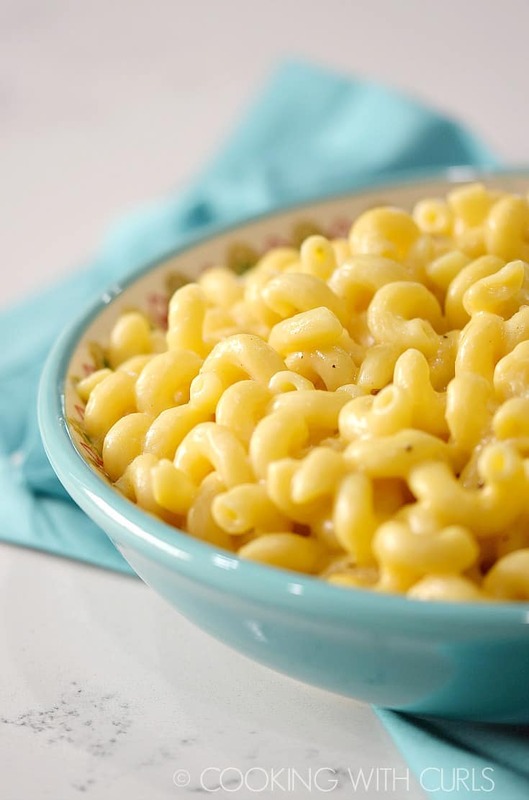 If you do not have an Instant Pot/Pressure Cooker, you can still make Homemade Macaroni and Cheese on the stove….. 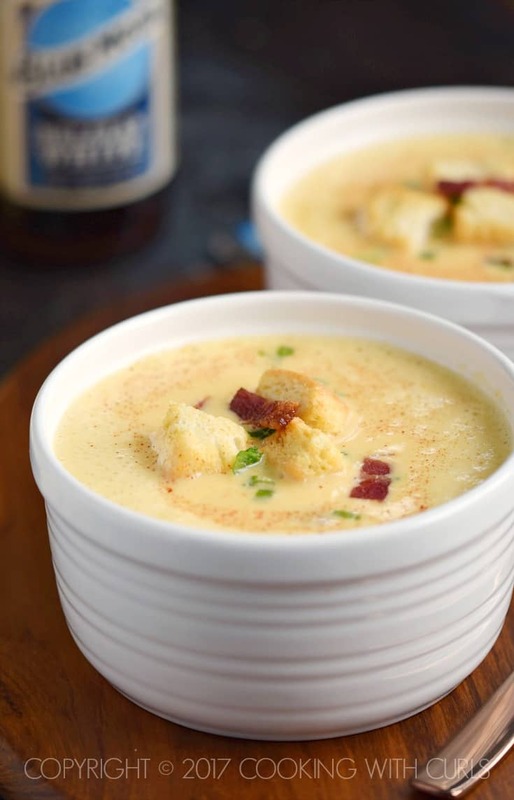 If you don’t have any noodles…how about Instant Pot Cheddar-Ale Soup instead…..
For a super easy meal, you have to try Instant Pot Spaghetti….. 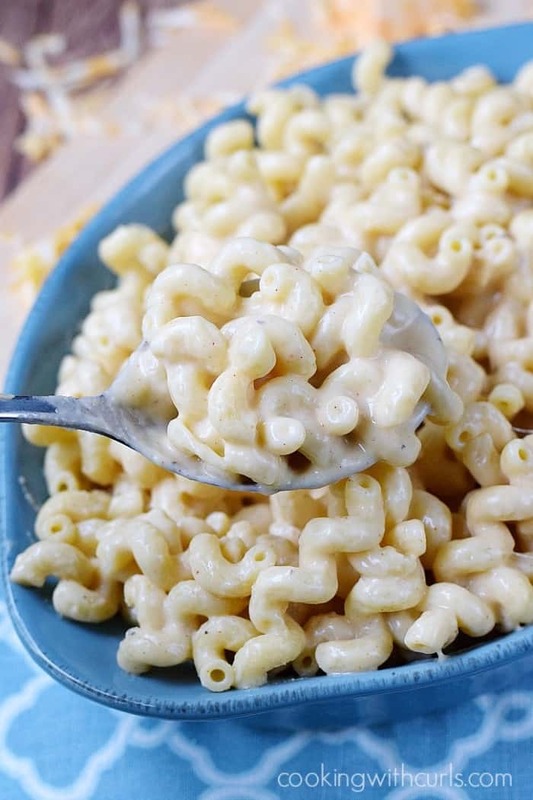 This rich and creamy Instant Pot Macaroni and Cheese is the perfect family meal any night of the week! Get creative and top it with bacon bits, broccoli, or additional cheese. 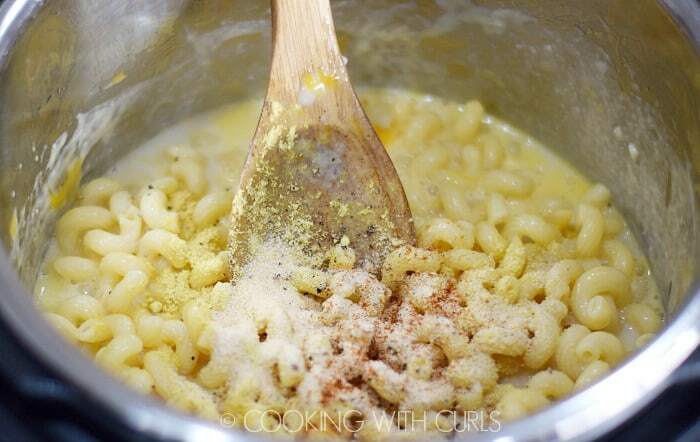 Add the dried pasta, water, salt and butter to the liner insert. Press the “Manual” button, on “High Pressure” and use the + and – buttons to set the timer to 4 minutes. When the timer beeps place a towel over the venting knob and “Quick Release” the pressure. Pull the knob in short bursts to avoid a foam explosion. If you hear gurgling, turn it off and try again. Remove the lid. Press the “Cancel” button, then the “Saute” button. Add the cheeses a little bit at a time stirring in between. Continue stirring until all of the cheese is melted. Pour in the milk and add the dry mustard, paprika, onion powder and cayenne. Stir until thoroughly combined and the mixture starts to thicken. Season to taste with sea salt and black pepper. Turn the pressure cooker off and serve.